If you do this, Ryan explained, you can avoid doing stupid things like running out of air, and you will make sure your diving group stays in sync no matter what happens down there. Do remember that you can’t actually talk to each other under water, so making a clear plan ahead of time is essential. Do you and your diving buddy know where you’re going first and next? Do you know where you’re NOT going? How much time will you stay down and at what depth? I’m sure you can already see the business parallels… Once you have planned the dive, you have to “dive the plan.” Meaning, you want to have relentless and focused execution. You can’t get distracted by some shiny object and swim off in another direction. You can’t suddenly decide to check out a cool tunnel and leave your diving buddy wondering if you were eaten by a great white shark. You must plan the dive and dive the plan. In business, planning the dive is strategy, and diving the plan is execution. If you have a team, it’s particularly important to make sure you all stay aligned and are actually on the same dive! You’d be surprised in how many companies everyone has a different notion of what success is and how to get there. The team, or divers, are swimming off in all different directions, and as a result they are going in circles. This is part of why you’ll often hear successful entrepreneurs say in response to some amazing new idea for a company: “Ideas are cheap. It’s all in the execution.” Even if it’s just you and few interns right now, it won’t always be that way and you’ll attract better divers if you know how to set a strategy and execute on it efficiently. How are you are all going to get to the buried treasure together? Have we set goals that are ambitious but achievable? Do we know what we need to do every quarter and every month to get to our goals? Are we using a strategy road map that we return to on a regular basis? Do we have the right people on our team? What changes can we make in our business this year to turbocharge our revenues? If you have some answers but could use help planning the dive, it might be a good time to consider working with a coach or mentor, or joining a community of other entrepreneurs where you can get access to strategic planning tools. There are great resources out there, including some free ones like the One Page Strategic Plan (OPSP) created by business coach and founder of the Entrepreneurs’ Organization, Verne Harnish. You can download a copy for free here. As you consider what strategy to adopt, remember a powerful hint from Tony Robbins (who created a $5B business empire): “Success leaves clues.” I always like to remind entrepreneurs that your products and services should be original, but the way you sell them doesn’t have to be. In other words, if you want to be successful, study the strategies used by successful companies and then adopt what works for you. At my company, Little Pim, we knew the Baby Einstein story inside and out, not only for fundraising purposes, but to help establish our product and distribution road map. Baby Einstein, for those of you who don’t know, was a video series for babies and toddlers created by a mom in her basement that she then sold to Disney for $25M just five years after launching. We learned that Baby Einstein started with videos and then added books, flash cards, and plush toys in a very particular sequence. So when we had questions like “when is the right time to start making games?” and “should we focus on adding more products or finding more distribution channels?”, we looked to their product roadmap for clues. We also learned which strategic partnerships had propelled them into the multi-millions so we could (and ultimately did!) do the same. We didn’t follow everything to the letter, and we looked at other businesses in adjacent fields too, but having those reference points was invaluable. As you map out your dive in 2018, commit to researching what you can find online about competitors or giants in your field, but also do some undercover sleuthing. Find a friend who used to work at a successful company in your field (or an adjacent field) and find out the nitty gritty details of what made that company successful. I found someone who used to work at the language teaching giant Rosetta Stone (which was doing about $250M annually when Little Pim was at about $1M) and was able to learn about some of their key milestones and decisions (When did they sign their first big distribution deals and how were they structured? Did they distribute to other countries directly or find local partners? Were their kiosks in airports a money-maker or more of a loss-leader for branding?). If you can find out details like their biggest revenue generators, distribution wins or highest margin products, it could be priceless information. Remember, success leaves clues, and it’s your job to follow that trail. Then take what you find and discuss it with your team and advisors to see what seems to apply to your business and growth plans. They have the right team, full of highly-disciplined, action-oriented people. The team comes up with a plan. The team executes the plan through disciplined action. He sums it up like this: Strategy + Relentless Execution = Success. These “great” companies also had other key characteristics, like humble and powerful leaders, and it’s worth reading the book to see what those were and how you measure up. But for now, let’s focus on the strategy. Get the right diving buddies, make a plan, and dive the plan. It sounds so simple, but you’d be surprised how few companies take the necessary time to make the plan. And even when they do make the plan, how few are able to execute with focus and discipline. Great companies had a variety of other characteristics Collins outlines, including a “BHAG” – a Big Hairy Audacious Goal they set that may seem just out of reach, but not totally impossible. It’s both aspirational and concrete, qualitative and quantitative. It likely won’t be something you’ll achieve in the next year, five years, or maybe even the next decade, but it is something you can achieve with a laser-like focus and action-driven team. Check out these BHAGs below, and you can create your own by using this form. When Sam Walton, founder of Walmart, founded his very first dime store in 1945, he set the BHAG to “make my little Newport store the best, most profitable in Arkansas within five years.” As the company grew, Walton set BHAG after BHAG, including the goal to become a $125-billion company, which they met and exceeded (they reached $200 billion back in 2001). The point is not to find the “right” BHAG, but to create a BHAG so clear, compelling, and imaginative that it fires up you and your team and conveys the big, exciting vision you have for the treasure you will find at 100 feet below the surface! What if we don’t make our goals? What if I come up short as a leader? What if we mess up on the execution? FOCUS. AND ASK FOR HELP. I came up with this while teaching my son to tie his shoes. He was having a very hard time mastering this skill around age seven, and when I explored why that was, I found that he wasn’t actually looking at his laces while tying them, and when he reached the part where he couldn’t figure out the next step, he would start over instead of asking for help. I taught him the two-step magic sequence, “Focus. 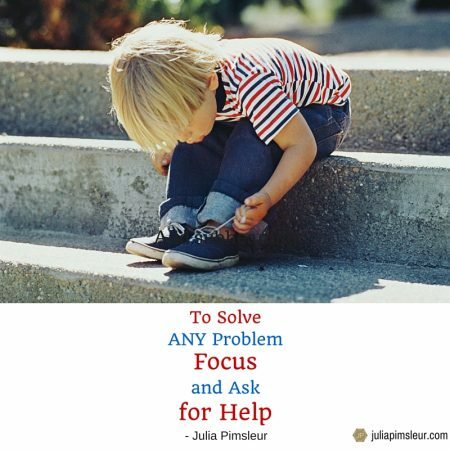 And ask for help.” and later realized that this is the solution to just about every challenge. Every time I have been at a major crossroad in business, whether around a strategic decision or a new hire, if I push everything else aside, truly FOCUS and then ask for HELP in the areas I haven’t mastered, nothing is unsolvable. And strategy is no different. So as you get ready for 2018 to be a year of huge success and revenue growth in your business, remember to PLAN THE DIVE AND DIVE THE PLAN. And don’t forget to ask for help if you have trouble with the bunny ears! See you down below. P.S. Graduates of my Million Dollar Women Masterclass emerge from our four-month program with a Strategic Plan that has been vetted by me and our business mentors. The next Masterclass starts on January 25th and seats are filling up fast. As one of our grads writes: “I thought I knew what I was doing but now I REALLY know – thanks to Masterclass, I am creating and implementing the right strategy and systems to scale up my business.” To discuss your 2018 strategy and learn about Masterclass, book a free 45 minute Accelerate Session. There are limited spots, so don’t delay if you want one!